A note on spoilers: whilst this review avoids discussing specific plot details, there are inevitably some minor spoilers. This is it, the moment that the DC Comics brain trust has been planning for and the readership nervously awaiting…the new dawn of the DC Comics universe. Taking its lead from the fallout of Superman #52 and Justice League #50 (concluding the story arcs The Final Days of Superman and Darkseid War respectively), DC Universe: Rebirth #1 facilitates a new beginning for the DCU that seeks to reconcile elements of the rebooted ‘New 52’ continuity, instigated in 2011 by the Flash-centric event Flashpoint, with remnants of the ‘old’ universe and coalesce them into a fresh and cohesive whole. As the title of this 80-page one-shot suggests, this is not a line-wide reset in the vein of the New 52 but is simply a refresh that restores a sense of optimism that many readers felt had become diminished by the darker and generally more downbeat storytelling of recent years. 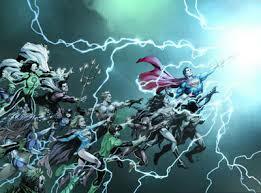 Who better to entrust this great task with other than DC Comics’ star writer and chief creative force Geoff Johns? Johns’ love for this universe and its players has already been evidenced via his efforts in the now iconic Green Lantern: Rebirth and The Flash: Rebirth mini-series, proving his ability to focus sharply on character relatability amongst epic backdrops (he even made an often-riddled DC hero cool with his short-but-sweet run on Aquaman for the New 52). Told from the perspective of the original Kid-Flash/Flash successor Wally West, Johns deftly weaves together the strands of multiple aspects of the DCU and with some careful tweaking helps to reshape, or perhaps more accurately realign continuity in a manner that doesn’t dismiss the New 52 but reintroduces elements that have felt missing, including some key character relationships that were all but wiped out post-Flashpoint. With the DCU befalling to numerous universe destroying events and resets over the last thirty years or so – from Crisis on Infinite Earths to Infinite Crisis and Flashpoint – it’s commendable that Johns has managed to skilfully balance past and present with both reverence for legacy and mindfulness of the future, the only issue being that it hampers accessibility to a certain extent. Whilst it’s still possible for new readers to enjoy the book it’s ultimately enriched and enhanced by a deeper understanding of overall DC Comics history (and will likely hold more punch for the reveal of who we learn is actually responsible for ‘meddling’ with the universe). It’s a celebration of that history, which also serves as a swansong – at least for now – for Johns as he spearheads the development/re-adjustment of DC’s film universe. John’s script is emotional, nostalgic and epic in scope and DC Universe: Rebirth is brought to life by top artists Gary Frank, Ethan Van Sciver, Ivan Reis and Phil Jemenez (with the support from various inkers and colours by Brad Anderson and Hi_Fi). Each has their own particular style yet work in unison to provide the book with relative visual consistency across its four chapters and epilogue and it certainly looks great where it needs to, rich and detailed throughout. Through the course of the book’s chapters are a series of vignettes featuring characters such as Batman, the pre-Flashpoint Superman, the Atom and Blue Beetle that help set the stage for what is to come and more of which should be revealed in the various forthcoming character specific Rebirth one-shots. Yet, in the end, it’s Wally’s story that both holds everything together and serves as the catalyst for what lies ahead. Although his journey through the Speed Force is a tumultuous and emotional one, it’s its conclusion that conveys the overall message that DC’s Rebirth promises: hope. The bottom line: Together with a team of top artists, Geoff Johns presents a celebration of the past with hope for the future to usher in an exciting new dawn for the DC Comics universe with the emotionally charged and epically realised DC Universe: Rebirth. DC Universe: Rebirth #1 is published by DC Comics and is available in print and digital formats now. Cover art for ‘DC Universe: Rebirth’ #1 by stellar artist Gary Frank. Following the huge critical and commercial success of X-Men: Days of Future Past, director Bryan Singer returns once again to helm the latest chapter in 20th Century Fox’s long running X-Men film series, based on the lucrative and ever popular Marvel Comics property. Given that Singer’s original foray into the Marvel mutant universe was with 2000’s X-Men (the success of which is credited with launching the modern superhero film craze that we enjoy today), you would be forgiven for thinking that he would not have anything further to give to the franchise – yet it feels that Singer channels just as much passion and energy into X-Men: Apocalypse as he did on the rather excellent Days of Future Past. The story for this X-Men outing centres on the emergence of the all-mighty and powerful being known as Apocalypse, believed to be the world’s first mutant. Ruling over the denizens of ancient Egypt, he is betrayed and left for dead until revived in the film’s setting of the early 1980s. Needless to say, Apocalypse soon plots revenge against humanity and seeks to use his powers to reshape the world as he sees fit. It’s this threat that sees Charles Xavier unite fresh blood with some familiar faces to build a new team of ‘X-Men’ and prevent the annihilation of the human race. The threat is a familiar one for comic book superhero films but world-ending scenarios coupled with epic action and jaw dropping special effects is what the audiences for these films have come to expect and it makes proceedings all the more entertaining. Like Days of Future Past and Marvel Studios’ recent smash Captain America: Civil War, Apocalypse features a large roster of characters yet never feels as though it falters under its own weight. Whilst future X-Men Storm, Angel and Psylocke (Olivia Munn) feature in largely introductory roles the story of Apocalypse focuses more significantly on younger versions of Cyclops, Jean Grey and Nightcrawler who under the guidance of Xavier, Hank McCoy (aka X-Man ‘Beast’) and Raven (aka the shape-shifting Mystique) learn to use their abilities ‘for the cause’. The new cast fit their parts well and complement each other nicely with plenty of room to further develop their characters in future instalments. McAvoy and Fassbender are as great as they always have been as Professor Xavier and Erik Lehnsherr/Magneto respectively, the latter served with some really great dramatic elements to chew on, it’s just a shame that Fassbender’s part feels diminished in the film’s later acts as he falls under the control of Apocalypse. it’s also a little disappointing that although the two actors are (rightfully) given an appreciable amount of screentime, there is actually little that they share together, as the chemistry between them has been such a key part to the success of their previous X-Men outings. But what of Evan Peters, who stole the show as Peter Maximoff – aka the speedster called Quicksilver – in Days of Future Past? Well, the good news is that he does so again and this time he enjoys a much larger role and Singer and his team outdo what they did in Days of Future Past to deliver one of the film’s greatest and most pleasing sequences. As the titular antagonist of the film’s subtitle, Oscar Isaac (crack pilot Poe Dameron in Star Wars: The Force Awakens) imbues Apocalypse with a – for the most part – subtle intensity, the make-up design allowing him to express and emote with an appropriate mix of intellect and sinister snarl. 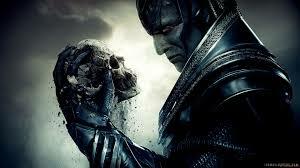 The finale of Apocalypse facilitates the requisite spectacle as the triumphant unison of this new team of heroes plays out against peril and large scale destruction on a level that exceeds that of Days of Future Past and with a few surprises and fan pleasing in-jokes thrown in for good measure, X-Men: Apocalypse is another successful entry for the franchise. The bottom line: With the same level of fun and excitement as Days of Future Past, X-Men: Apocalypse is a pleasing addition to the long running series, featuring some promising new cast members amongst beloved familiar faces. X-Men: Apocalypse is in cinemas across the UK now and opens in U.S. theatres and other territories on 27th May. Oscar Isaac prepares to wreak havok in 20th Century Fox’s ‘X-Men: Apocalypse’. Following the high stakes and drama of recent issues of The Amazing Spider-Man, writer Dan Slott kicks off a new story arc with a fun and engaging opening chapter that gives our friendly-neighbourhood wall crawler the opportunity to let his hair down a little…just a little. With Peter Parker’s recent guest appearance in Brian Michael Bendis’s Invincible Iron Man, it seems only fair that Tony Stark would pay a visit to New York City – with new employee Mary Jane in tow – as Peter throws a charity fundraiser for the Uncle Ben Foundation. It’s as funny and as cringing as you would imagine and Slott makes great use of both characters in making things uneasy for Peter. The interplay between Peter and Tony is the highlight of this issue, the latter’s ego threatening to deflate the former’s as Slott evokes all of those underdog qualities that have endeared so many to one of Marvel’s most iconic characters for so long. Peter Parker may now be a billionaire industrialist as head of fledgling company Parker Industries but in the end he’s still the same old Peter Parker, just a little older and maybe even a little wiser. It’s when the supervillain known as Ghost shows up that this issue’s best moments arise, with Peter and Tony ‘suiting up’ to tackle the threat only for our central heroes to reduce themselves to some high school bickering as they try to outshine one another, leaving Ghost hilariously bewildered in the process. As the action unfolds and the pair set aside their egos, Slott leaves readers with perhaps the greatest and most memorable team-up since Marvel’s ‘All-New, All-Different’ relaunch and closes the issue with the necessary threads to be woven throughout this latest story arc as the impending threat of new foe ‘Regent’ is revealed. Guiseppe Gamuncoli’s visuals on The Amazing Spider-Man continue to be a perfect complement to Dan Slott’s scripts, his sharp, detailed pencils and slightly cartoonish character facials (accentuated by Marte Garcia’s vivd, high-def colours) fitting the overall tone of the book. Although Gamuncoli is not afforded as much opportunity to depict the epic blockbuster set-pieces of prior instalments (readers have been truly spoiled in recent months with Spider-Mobile action, orbital plummets and subway train fights), there’s still plenty of energy and momentum to the action that Slott facilitates in this issue. The bottom line: The Amazing Spider-Man takes a moment to breath, if only briefly as Dan Slott and Guiseppe Gamuncoli present a fun issue bolstered greatly by a guest appearance from Tony Stark. The Amazing Spider-Man #12 is published by Marvel Comics and is available in print and digital formats now. 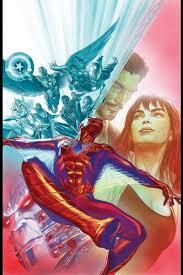 Another superlative cover by Alex Ross for another fun issue of Marvel’s ‘The Amazing Spider-Man’. Starring: Chris Evans, Robert Downey Jr, Scarlett Johansson, Sebastian Stan, Anthony Mackie, Don Cheadle, Paul Bettany, Jeremy Renner, Elizabeth Olsen, Paul Rudd, Chadwick Boseman, Tom Holland, Daniel Bruhl. After eight years and a dozen film releases, Marvel Studios deliver yet another satisfying and crowd pleasing punch of entertainment in the form of Captain America: Civil War (based loosely on the game changing comic book series by Mark Millar and Steve McNiven), the third solo outing for Chris Evans’s Captain Steve Rogers. Via its blend of sophisticated storytelling and popcorn blockbuster action, 2014’s Captain America: The Winter Soldier presented a superior breed of a comic book superhero film and Civil War manages to repeat that successfully, placing these beloved Marvel characters bang in the centre of a Bourne-esque action thriller that reflects real world political and social concerns and explores the moral ramifications to the actions of this altruistic, yet unregulated group of special individuals. 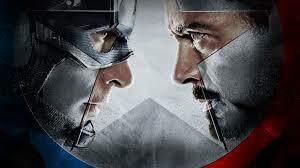 In the wake of the events of The Winter Soldier and Avengers: Age of Ultron, Steve Rogers – aka Captain America – and his fellow Avengers find their latest mission having devastating consequences, resulting in the United Nations imposing regulatory control on ‘Earth’s Mightiest Heroes’, the opposing viewpoints of Rogers and Tony Stark/Iron Man causing the rest of the group to divide their allegiances. Fears that Civil War would merely be ‘Avengers 2.5’ are quickly allayed for despite the inclusion of a plethora of characters, including Robert Downey Jr’s Tony Stark/Iron Man, this is most definitely a Captain America film with an emotional core that is firmly centred on Steve Rogers, who finds his values and friendships threatened as he once again fights for the freedoms he has always sought to protect. With the narrative of Civil War focusing largely on Rogers and the fallout from The Winter Soldier as he strives to help redeem and clear the name of best pal ‘Bucky’ Barnes and his straining relationship with Stark (with Evans and Downey Jr once again delivering reliably strong performances), there might be some trepidation as to how the film’s expanded roster of superhero characters is handled. Thankfully, Civil War manages this with relative ease allowing each supporting character enough time and significance in proportion to their roles in the story with the likes of Black Widow, Scarlet Witch, Falcon, Vision, War Machine, Ant-Man and Hawkeye all given their moments to shine. Yet it’s the introduction of Marvel characters Black Panther and – triumphantly – Spider-Man that will have fans most excited for Civil War and the good news is that they’re both great. As T’Challa, Chadwick Boseman exudes the qualities of leadership in a restrained yet impassioned manner whilst evoking the requisite strength and physicality that the role of the heroic Black Panther demands. Whilst T’Challa/Black Panther is more significant to the plot of Civil War, the sheer delight of seeing Spider-Man amidst the action with his fellow Marvel heroes makes his inclusion worth the while as Tom Holland infuses Peter Parker with all the awkwardness and fun that comes with the character. Returning to directing duties are Anthony and Joe Russo, who helmed The Winter Soldier and will be tackling the behemoth Avengers: Infinity War two-parter. The Russo brothers deliver here as much as they delivered on The Winter Soldier and Civil War feels similarly well-balanced between character, story and visuals. There are some great set pieces (the highlight of which is an airfield showdown between ‘Team Cap’ and ‘Team Iron Man’ which stands amongst the best moments of any Marvel blockbuster) that the Russo’s inject with the same level of energy and heft they employed in The Winter Soldier, with the incredible choreography going hand in hand with superlative stunts and CGI spectacle. Whilst it may not be as intricately plotted as The Winter Soldier, returning screenwriters Christopher Markus and Stephen McFeely still provide a smart and layered script with depth of character amongst its social and political debates, together with some credible motivations for Daniel Bruhl’s main antagonist. Overall, Civil War is a deftly balanced film with a tone that offsets generally serious and thought provoking elements against well placed moments of humour and the fun and excitement audiences have come to expect from a Marvel Studios production that will once again satisfy the masses. The bottom line: Standing proudly alongside the very best of Marvel’s blockbusters, Captain America: Civil War is sure to excite and thrill audiences as it confidently hits all the right notes. Captain America: Civil War is in cinemas across the UK now and opens in U.S. theatres on 6th May. Whose side are you on? Former allies Captain America (Chris Evans) and Iron Man (Robert Downey Jr) face off in Marvel Studios’ ‘Captain America: Civil War’.